Joe Gentry from AA Temperature Services and his wife Janet will soon reopen the Charlotte County/Punta Gorda Speedway under a new name: 4-17 Southern Speedway & Events. According to Gentry, “Our absolute latest target date is January. I want to push progress along to get it opened during the cooler months,” he said. Race nights typically draw between 100 and 150 drivers and sometimes more than 100 race cars. 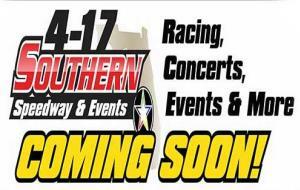 Like other tracks, the 4-17 Southern Speedway will organizes races by classes and model categories. The main races will run on Saturday nights up to 11:30 pm and the track will sometimes host specialty races on Sundays. Go-cart racing for both youngsters and adults will also be among featured events. No decision has been made on ticket prices. Gentry said most similar tracks offer general admission bleacher seats from $5 to $15, depending on the event, and “behind the pits” seats from $20 to $30. Getting the deal done required the Airport Authority to settle a dispute over the precious tenant’s claim for reimbursement for a safety fence erected along the spectator area. Since the tenant defaulted on rent payments, the Authority won the right to keep the fence. Getting the fence issue resolved and a contract signed had Authority board member Pam Seay smiling. “I’m thrilled,” said Seay, who, as the sister of a small-track racer, was a frequent race-night visitor to the track in its earlier days. Follow them on Facebook for updates and details!